Earlier this year I went to a birthday party - dessert potluck. Everyone was asked to share a favorite dessert. There was just one catch. It could not contain chocolate. That was easy for me. I just made mini cheesecakes. It was a very fun get together because I got to try some different kinds of desserts. One thing that I tried that I absolutely fell in love with was an English Trifle. I had never had one before - what a shame because they are the yummiest and easiest to make. I suppose it's called a trifle because it has three layers. Normally when I think of the word "trifle" it makes me think of people who worry over unimportant things. It's in the scriptures in a few different places. See this Link. Well, the dessert I had that night was a very simple thing to make. I got the recipe and tried it a few months later. Oh yummy. Here is a link to that recipe. I made it back in June. 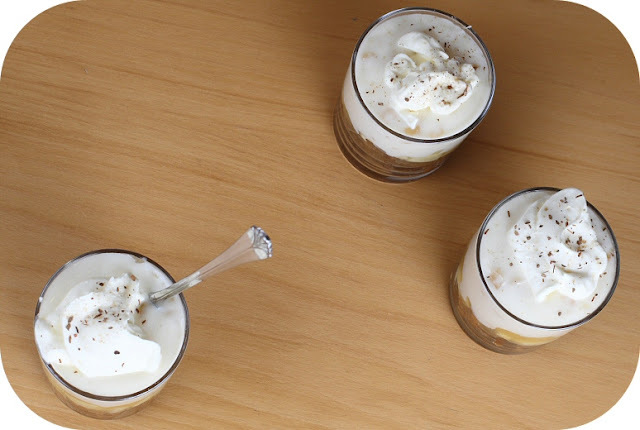 And since then, I have come across several other yummy trifles to try - they are on my wish list. Yes, I have an actual "wish list" for treats to make! Then, last week I was wondering what the Sugar High Friday theme was for December and to my surprise it is trifles. Yippee. I've participated in 3 or 4 Sugar High Fridays this year. In case you are new to it - it's an excuse to make something sweet once a month, blog about it and share it with everyone. The Sugar High Friday was created by blogger Jennifer of The Domestic Goddess. Every month a different blogger hosts the Sugar High Friday and can choose the theme. This month Ivonne of Cream Puffs in Venice chose trifles. Ivonne, thank you so much for suggesting this theme. It has given me the opportunity to try some different combinations and I'm just loving it. One of the reasons to love a trifle, as I mentioned before, they are easy to make. Or at least they can be as easy to make as you like. For me, I do like an easy dessert now and again. I choose to combine 3 simple ingredients to make one sweet holiday dessert. Ingredient 1: ontbijtkoek - translation: breakfast cake. Yep, in the Netherlands they eat cake for breakfast! Yippee. The breakfast cake is like a really sweet version of gingerbread. If you are in the U.S. I suggest trying this recipe with your favorite ginger bread recipe or spice cake. Ingredient 2: apple pie filling - which, unfortunately they didn't have in my local grocery store. But like Michelle of Brown Eyed Baker - I turned my lemons into lemonade. I found a seasonal apple-cinnamon-vanilla jam and combined it with freshly peeled and diced apples. This gave my trifle extra crunch! 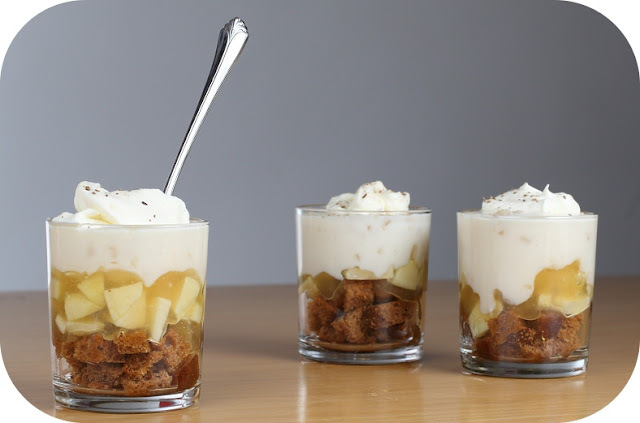 Ingredient 3: apple and cinnamon vla - translation: can best be described as thin pudding. I love it. I never really cared for vla until during my last pregnancy when I got to love eating it together with stroop wafels and whipped cream. There are a few Dutch brands that have a seasonal winter vla containing apples and cinnamon and it tastes just like an apple turnover. It's so yummy and perfect for this trifle. So, I cut up my ontbijtkoek into little pieces. And that became my first layer or bottom layer. Next, I combined my apple-cinnamon-vanilla jam together with my freshly peeled and diced apples. This became my second layer. Then I poured that lovely apple and cinnamon vla over top. So easy, so simple - and so delicious. Then just for looks - for the professional photos really - I added a dollop of fresh whipped cream and a sprinkle of freshly ground cinnamon. If only, I could eat like this all the time... but then I'd surely never lose my Santa belly. Hi Michelle. Well, you know - you can't go wrong with chocolate! I'm thinking of some other combo's I can make for Christmas as well. I was considering doing a pumpkin-oreo thing. might that be a parfait though? again, i trifle with these little nuances. The problem with individual ones is that I would just eat them all! I love these so much ... the combinations ... everything! @creampuff - actually, i did eat them all... anyone in the house could eat them but no one did, which forced me to eat them ;) i've since bought a full size trifle dish - which i plan on using a lot!! !